Explanation: Wisps like this are all that remain visible of a Milky Way star. About 7,000 years ago that star exploded in a supernova leaving the Veil Nebula. At the time, the expanding cloud was likely as bright as a crescent Moon, remaining visible for weeks to people living at the dawn of recorded history. Today, the resulting supernova remnant, also known as the Cygnus Loop, has faded and is now visible only through a small telescope directed toward the constellation of the Swan (Cygnus). The remaining Veil Nebula is physically huge, however, and even though it lies about 1,400 light-years distant, it covers over five times the size of the full Moon. The featured picture is a Hubble Space Telescope mosaic of six images together covering a span of only about two light years, a small part of the expansive supernova remnant. 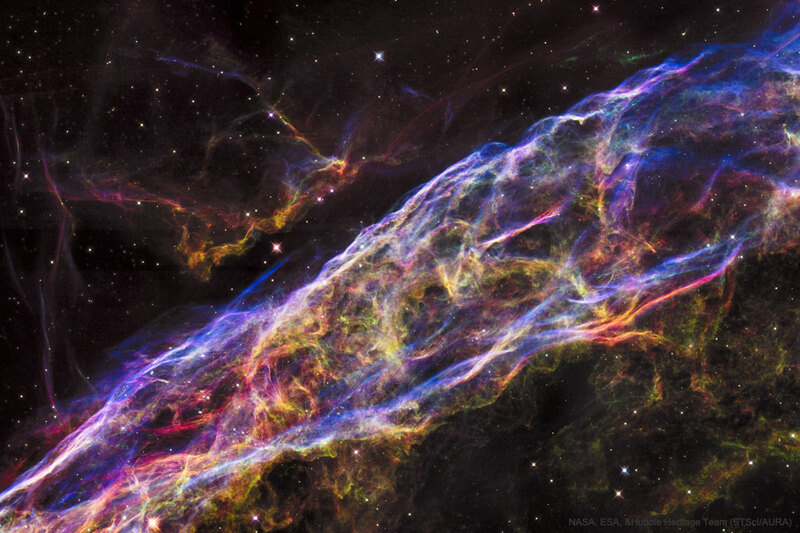 In images of the complete Veil Nebula, even studious readers might not be able to identify the featured filaments.